Q. Do my union dues pay for WCT Pension Plan benefits? A. No. Only employer contributions made on your behalf and their investment earnings pay for Plan benefits. Q. Can I pay additional contributions to the Plan to increase my benefit? A. Additional contributions outside of your pension agreement cannot be accepted by the Plan. Only contributions paid by your employer according to your collective bargaining agreement can be accepted. Contact your local union if you would like more information about your contract and contribution rates. Q. Are employer contributions paid on all of my hours? A. That depends on what your collective bargaining agreement provides. For example, not all collective bargaining agreements require Plan contributions for all forms of paid hours such as overtime hours. Your agreement may contain daily, weekly, monthly or annual maximums on the hours that require contributions. Be sure to contact your local union if you have questions about your contract and whether contributions are required for all the hours you work. Q. Will the pension rate for my current employer change throughout my employment? A. The pension rates in your collective bargaining agreement can never decrease. Your pension rate will either remain the same or increase. Typically, pension rates increase over time based on each new negotiated contract. Q. Once I’m in my fifth vesting year, do I have to wait until the end of the year to be vested? A. If you’re in your fifth vesting year, you’ll be vested when you complete your 500th covered hour. You don’t have to wait until the end of the calendar year to be vested. While most active participants are vested after five years of covered employment, it may take longer if you don’t work the minimum hours each year or if you left the Plan before 1991. Click here for more information about vesting. If you have questions about your vesting status or Plan coverage, contact your Administrative Office. Q. My bargaining unit joined the Plan in 2008 when I was age 53. I’ve been continuously employed there for four years. If I work full-time, when will I become vested? A. In your situation, based on the special vesting rule for units first entering the Plan on or after January 1, 2002, the Plan counts two of your four years of continuous past employment as years of vesting service. This means you only need to earn three more years of vesting service to satisfy the Plan’s five-year vesting requirements. Click here for a chart that shows how many years of continuous past employment the Plan counts based on your age. Q. My Personal Benefit Statement shows that 2,080 hours were paid on my behalf last year. But I actually worked more hours than that. Are contributions made for overtime? A. Your Personal Benefit Statement only shows the hours for which pension contributions were paid. Your collective bargaining agreement may not require your employer to contribute on overtime hours. Or it may have a monthly or yearly maximum on the number of hours that require pension contributions. Click here for a sample statement that shows the employer contributions paid in the previous calendar year based on the participant’s collective bargaining agreement. Q. Before I was vested, I had low hours for a few years until I began working full time. Does that time still count toward the amount of my pension? A. That depends. As long as you don’t have five consecutive interruptions of service (years when you earn less than 250 hours of service), all your covered hours count when calculating your benefit. Remember, only years when you have at least 500 hours of service count for vesting. Click here for an explanation of forfeiture of service. Q. In the past, I took a non-union job when there was not enough Teamster work available. How could that hurt my pension benefit? A. If you leave covered employment for too long before becoming vested, you may suffer a forfeiture of service. However, if you return to covered employment before having a forfeiture and later become vested, your entire period of covered employment counts toward your pension benefit. Q. I worked three years in covered employment and then transferred to a non-covered management position with the same employer before I was vested. Will I lose the three years I earned before moving into management? A. No. As long as you remained continuously employed, your non-covered work with a covered employer may count toward vesting and help protect you from a complete loss of your Plan benefits. Click here for more information. Q.I worked in covered employment for two years in the late 1960s, but left covered employment and had a break in service in 1971. In 1985, I returned to covered employment and later became vested. Can my two years of covered employment from the 1960s be restored and counted toward my Plan benefits? A. Yes. As long as you had no forfeitures of service after 1975 and became vested before 2004, you may qualify to have your pre-1976 credit restored and counted toward your Plan benefits. Click here for more information about pre-1976 restored covered hours. Q.If I work more than 2,080 covered hours each year, is there a limit on how much pension I earn? A. No. All basic contributions your employer makes for your covered work count toward your monthly pension. But remember to check if your collective bargaining agreement limits the number of hours your employer is required to contribute on your behalf (click here for more information). Q. How can I find out my estimated pension amount? A. Your Personal Benefit Statement shows the pension benefit you earned for your covered work in the prior calendar year and your total accrued benefit earned to date, payable at age 65. The Plan also offers other forms of benefit information explaining your Plan status and accrued benefits (click here for more information). If you’re near retirement, your Administrative Office can verify your benefit amount. Your monthly benefit is calculated based on the exact benefit percentages that apply to your covered hours in the months and years they are earned. Q. Once I retire, how long does it take to get back all the contributions that were paid into the Plan for my covered employment? A. The answer depends on how long you work and how much is contributed. For most participants who retire at normal retirement age, it takes approximately four years in retirement for the Plan to pay out more dollars than the contributions paid in by your employers. Q. How are service credits calculated under the five-year average formula? A. 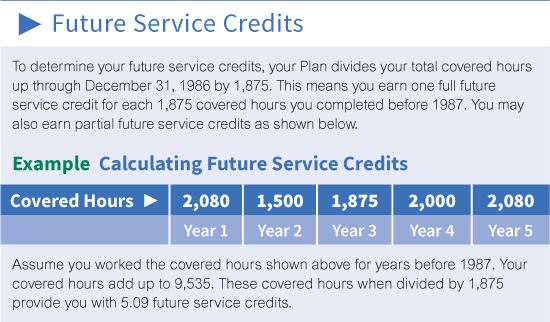 To calculate service credits, your Plan divides the total of all your covered hours before 1987 by 1,875. The result is your total service credits. If you have more than 1,875 covered hours in a calendar year before 1987, those extra hours add to your total service credits (click here for an example of calculating total service credits). Q. How can I find out my five-year average rate and how much I get at retirement? A. 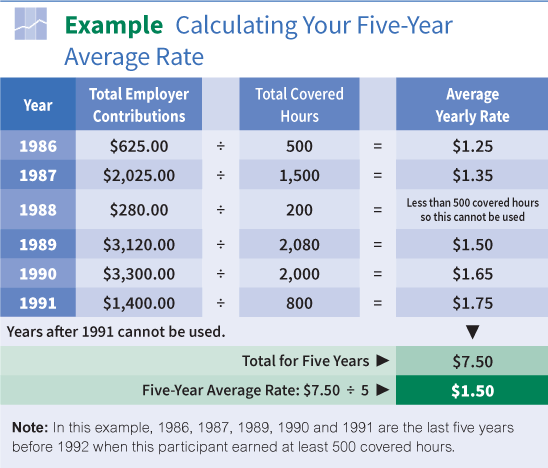 Your five-year average rate is the average of the contribution rates paid by your contributing employers in your five most recent calendar years before 1992 when you worked at least 500 covered hours (click here for an example of how to calculate your five-year average rate). Once you know your five-year average rate, click here to look up the value of that rate in Table 4. This value is multiplied by your total service credits to determine the five-year average benefit you’ll get at retirement. Remember, if you have coverage after 1986, you also earn a contribution account benefit that adds to your total retirement benefit (click here for more information). Q. I joined the Plan in 1987. Does this mean I don’t have a five-year average benefit? A. That’s correct. All your benefits are earned under the contribution account benefit formula (click here for more information). Q. Why is recent coverage important? A. Many Plan benefits are not available unless you have recent coverage. Others are higher if you have recent coverage. Click here to see which Plan benefits require recent coverage and which benefit amounts are higher with recent coverage. Q. I’ve been in the Plan full-time for many years. Do I still have to worry about maintaining recent coverage until I retire? A. If you maintain your recent coverage until you complete 25 years of contributory service, your recent coverage is locked in for good. You can’t lose it by leaving covered employment or going on a reduced work schedule, even if you have not yet reached your earliest retirement date. See the Recent Coverage section for an explanation. Q. How can I make sure I have recent coverage? A. If you stay in full-time covered employment up to your earliest retirement date (usually age 55), you always have recent coverage. You have recent coverage by working 1,500 covered hours in the 60-month period immediately before your pension effective date, your earliest retirement date or any date that falls between. As long as you continue to work at least 500 covered hours each calendar year—until your earliest retirement date—you won’t lose your recent coverage. If you go on a reduced work schedule for more than a year, it could affect your recent coverage. Check with your Administrative Office about your exact situation. Q. If I wait to draw my pension at age 68 or 70, will my benefit be higher? A. Yes. Your pension grows with each year of covered work. 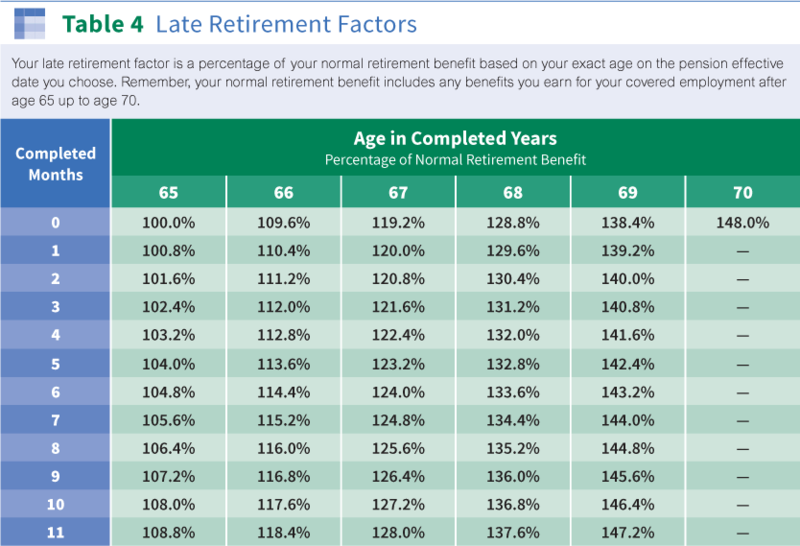 If you retire after age 65, you also qualify for a late retirement factor that gives you an even higher benefit for the time you wait to retire after age 65 (click here to see how your late retirement factor increases). Remember, you must start receiving benefits by age 70, even if you are still working. If you’re near retirement, it’s a good idea to request an Estimate of Benefits based on your possible retirement dates. Your estimate helps you compare your monthly benefits depending on when you decide to retire. Q. Is my pension affected by Social Security benefits? A. No. Unlike some plans, your benefits are not coordinated with amounts you may receive from Social Security. Q. I’m nearing age 65 and heard that I can start drawing my pension at age 65 and still work for the same employer. Is this true? A. Yes. Participants age 65 and older can start drawing their pension without quitting covered employment. Be sure to check with your local union or employer to see if your collective bargaining agreement allows you to continue working full-time once your pension benefits begin. Many contracts have rules about loss of seniority or other rights that may affect your retirement decisions. You must still file an application with your Administrative Office before benefits can begin. See the Applying for Retirement Benefits section for more information. Q.How do I find out if I’m covered under a PEER contract and at which PEER level? A. You can check your current collective bargaining agreement (available through your local union or employer) or you can request the information from your Administrative Office. If you’re near retirement, it’s a good idea to request an Estimate of Benefits based on your possible retirement dates (click here for more information). Your estimate helps you compare your monthly benefits depending on when you decide to retire. Q. If I continue to work after I qualify for PEER/80, do the extra years I work add to my pension amount? A. Yes. Your retirement benefit is based on all the basic contributions your employer pays into the Plan for your covered employment up to your pension effective date. Remember, it is only basic contributions that count toward your benefit amount—not PEER contributions. Q. How do I make sure I stay eligible for PEER? A. You need to earn at least 1,000 PEER hours during the 24-month period ending with your pension effective date unless you’ve already locked in your PEER coverage. Click here for details about PEER Lock-in protection. In addition, you need to be vested, meet the PEER age and contributory service requirements and have recent coverage. Q. Do I earn a PEER point based on my anniversary dates with my employer? How are the 500 hours counted for PEER points? A. No. The Plan uses a calendar year for determining whether you have earned a year of contributory service towards your PEER points. For each calendar year that you work at least 500 covered hours under a PEER pension agreement, you earn a point. Q.Can I apply for my pension if I am in the process of applying for Social Security disability benefits? A. Yes. You may apply for your disability retirement benefit at any time. Assuming you meet the eligibility requirements for an early age retirement benefit, the Plan begins paying your age retirement benefit. If you are later awarded Social Security disability benefits, and your disability onset date is no more than 24 months after your age retirement pension effective date, your benefit is converted to a disability retirement benefit payable from your disability entitlement date. Q. If I become disabled, how is my disability retirement benefit calculated? A. Your disability retirement benefit is based on a percentage of your normal retirement benefit at age 65. 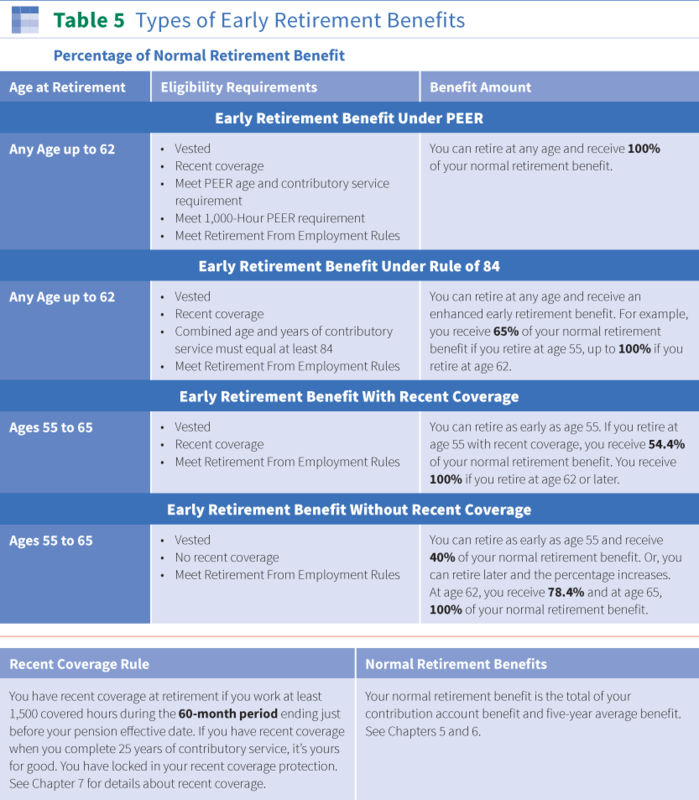 If you’re under age 55, your benefit is 85% of your normal retirement benefit. If you’re age 55 or older, your benefit is the same as if you took early retirement, but never less than 85% of your normal retirement benefit. It can be higher if you qualify under a PEER program or the Rule of 84. See the Early Retirement section for more information. Q. What happens if I recover from my disability? A. You must notify your Administrative Office immediately that you are no longer receiving Social Security disability benefits. If you are eligible for an age retirement benefit, your disability benefit is converted to an age retirement benefit. If you are not yet eligible for early retirement, you return to vested status. It’s important to discuss your disability status with your Administrative Office if your status with Social Security changes. Q. If I become disabled, can I wait to receive disability retirement benefits until I meet PEER eligibility next year and receive a higher benefit? A. Yes. You can postpone your disability retirement benefits until you qualify for unreduced benefits under a PEER program. However, you must remain eligible for Social Security disability benefits as well as meet the other eligibility requirements for Plan disability retirement benefits. See the Disability Retirement section for more information. Q. I am recently divorced and my property settlement says my ex-spouse is not entitled to my pension. I previously designated her as my beneficiary. Do I need to change my beneficiary designation if I no longer want my ex-spouse as my beneficiary? A. Yes. The Plan only recognizes the person named on the last valid Beneficiary Designation Form you completed before your death. It doesn’t matter if you later divorce. If there is a change in your family status, it’s extremely important that you contact your Administrative Office to request a new Beneficiary Designation Form. Q. I’m a single parent who recently joined the Plan. Will my children receive Plan benefits if I die before I’m vested? A. Even though you are not yet vested, your children may be eligible to receive child survivor benefits. 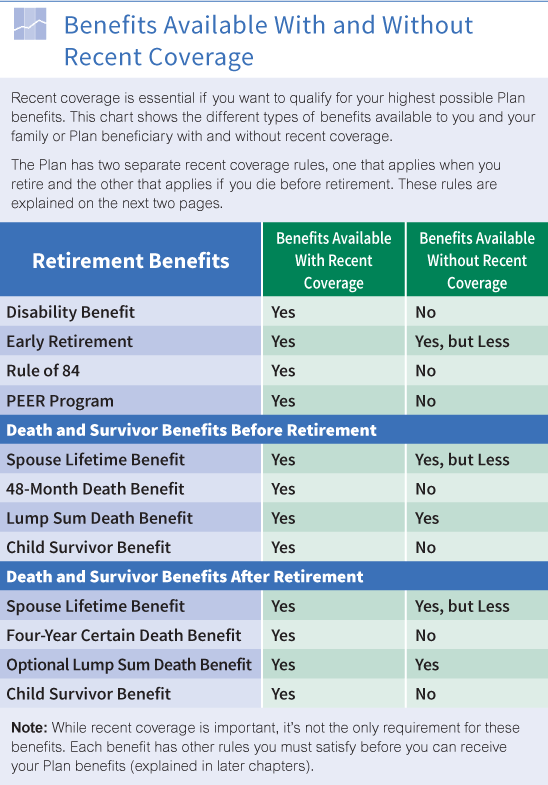 You must have recent coverage and meet the other Plan requirements explained in the Death & Survivor Benefits section. Be sure to tell family members how to contact your Administrative Office after your death. Q. I’m preparing a will to name those who receive my property when I die. Does the Plan pay death benefits to the beneficiaries named in my will? A. The Plan only pays death benefits to persons named as your Plan beneficiaries on the Beneficiary Designation Form supplied by the Plan and received by your Administrative Office before your death. See Applying for Death Benefits for more information. You may name your estate as your Plan beneficiary so that your death benefits are paid to your estate. If you are naming your estate, keep your will updated. Be advised that your will may need to be probated in order for Plan benefits to be paid following your death. Q. If my named beneficiary dies, how can I designate someone else to receive Plan benefits? A. The only way to name new beneficiaries or change a previous designation is by using the Plan’s official Beneficiary Designation Form (click here for an explanation). Your most recentPersonal Benefit Statement shows your current beneficiary and provides a Beneficiary Change Form. You can also download and print a new form. Designations made on forms used by other pension or health and welfare trusts, or for other union benefits such as life insurance, are not accepted by this Plan. There are no exceptions. Q. My last day of work is December 31, but I have four weeks of unpaid vacation. Can I start my pension on January 1 and continue to draw my vacation over the following four weeks? A. Yes. Assuming you have formally terminated your employment, you may choose a pension effective date the first of the month following your actual last day of work and continue to receive pay for vacation or sick leave from your last covered employer, as long as your collective bargaining agreement allows for this. You should check with your Administrative Office to find out whether your collective bargaining agreement allows contributions to be paid for vacation or sick leave after your last day of work. Q. What happens if I retire before age 65 and return to work for the employer who was my last covered employer within six months after I stopped working? A. If you are under age 65 and return to work for the same covered employer for any number of hours within six months after you stop work, Plan rules assume that you did not intend to retire permanently. Your benefits are temporarily suspended while you provide proof that you really did intend to retire permanently. If you do not provide satisfactory proof, then your early retirement benefit is cancelled. This means you must repay any retirement benefits you already received. Q. If my ex-spouse was awarded a portion of my retirement through our divorce, what documents do I need to provide to start my benefit payments? A. You must send copies of any court documents related to your ex-spouse’s entitlement to your pension to your Administrative Office immediately. Plan representatives can verify whether the documents are in compliance with federal law and Plan rules, and whether you need to seek an amended order or take other action. Click here for an explanation of the requirements for a Qualified Domestic Relations Order (QDRO). Q. If I leave the Plan after I am vested, when can I start drawing my pension? A. As long as you’re vested when you leave the Plan and are considered retired from employment, you can start receiving benefits as early as age 55, or even earlier if you qualify under the Rule of 84 or a PEER program. See a summary of these four types of early retirement benefits available to vested participants. Remember, any employment after retirement is subject to the Plan’s benefit suspension rules, unless you are age 65 or older. See the Working After You Retire section for more information. Q. I am planning on retiring under PEER/80. After my birthday in December, I will have 79 PEER points. When is the earliest date that I can retire under PEER/80? A. You earn your 80th point toward the PEER program after you work at least 500 covered hours in the next calendar year. As long as all other PEER eligibility requirements are met, you are able to retire under the PEER/80 program on the first of the month after you work your 500th covered hour. If you don’t work 500 covered hours in the next calendar year, you’ll have 80 PEER points after your next birthday. It’s important to note that you are not eligible to retire under the PEER program until your employer contributions are received and processed by the Administrative Office. If you do not want a lapse in income, you should work at least two to three months after the date you earn your final PEER point. Usually this allows sufficient time to process your application so that you receive your first benefit payment the month following your termination. Q.Once I retire and apply for benefits, how will I receive my first benefit payment? A. If you requested automatic deposit, your first benefit payment is automatically sent to your bank and you’ll receive a letter in the mail, confirming the amount of your first payment. If you do not request automatic deposit, your first benefit payment is mailed to your home address. Click here for more information about automatic deposit. Q.Will I be notified when I become eligible to begin receiving Plan benefits? A. No. The Plan does not notify you when you become eligible to receive benefits. It is your responsibility to stay up to date with your status under the Plan by reviewing your Annual Benefit Statements and requesting Work History Statements and Estimates from your Administrative Office. Once you are ready to retire, you must complete and return an application to the Administrative Office. Click here to find out how to request information from your Administrative Office. Q.What if I cannot provide a copy of my birth certificate as proof of my birth date? A. If you cannot provide a copy of your birth certificate, there are other documents that the Pension Trust accepts as proof of your birth date. Click here for a list of acceptable documents. A. Yes. As long as you are performing work that is within the 13 Western States, the Plan’s suspension of benefits rules will apply. It is important that you contact your Administrative Office before returning to work and request a formal determination of your proposed work to find out if it is suspendible employment. Q. If I was awarded a portion of my ex-spouse’s retirement through our divorce, do I have to wait until he retires to begin receiving benefits? A. No. If you were awarded a portion of your ex-spouse’s pension, you can begin drawing benefits when he reaches his earliest retirement date (usually age 55,or earlier if he is eligible to retire under a PEER Program or the Rule of 84). You should contact your Administrative Office for specifics about when you can begin receiving benefits. Q. I’m moving. How do I change my mailing address? A. It’s important to notify the Plan about changes to your address so you’ll receive important Plan information (such as Personal Benefit Statements, notices and newsletters). Send your new address (along with your Social Security number) to your Administrative Office in advance. You can also download and print a Change of Address Form from this web site. It’s also a good idea to send address changes to your local union and contributing employer. Please be aware that your local union and the Pension Plan are administered separately. Changing your address with your employer or local union will not update the address the Plan has on file for you.